Seefeld gets a prime listing for much the same reasons as its feature placement in the Family Skiing article. The resort less than an hour away from Innsbruck Airport, the beginner ski slopes are right in the middle of the village, it is at a decent altitude and it has ski instruction with a good reputation. There is a good choice of accommodation available and there is plenty to do outside skiing. And on the rare occasion that a beginner really hates the sport, it is one of the top cross-country skiing areas in Europe (that’s the version of skiing on the flat!) and has plenty of cleared winter walking trails. The only negatives? It’s not as cheap as some of the smaller village resorts and its nightlife can be pretty quiet outside high season. Söll is the only resort to make it into the list for both experts and beginners. While expert skiers might be discovering the full extent of the SkiWelt lift pass, beginners have their own options at the bottom and the top of the Söll gondola. Given good enough snow conditions, beginners can use the wide-open and unthreatening fields near the village to learn the basics before being unleashed onto the big bowl higher up the hill. And even there, a special easier beginners’ area means that the exposure to the altitude is not as threatening as it might seem. The après-ski may not be as full-on these days (Söll’s wild beginner nightlife made it the subject of a few documentaries in years gone by) but there are plenty of beginner skiers in the same position looking to unwind after a day on the slopes. From the cheap and cheerful world of Söll we go up more than a few hundred metres in altitude to the high mountain resort of Obergurgl. One of Austria’s real ski-in ski-out resorts, this is a village for those that want to learn and enjoy a bit of luxury at the same time. The hotels have a great standard of facilities and most are only a few minutes’ stroll from a lift or the ski school meeting place. One of Austria’s training academies for ski instructors is located up here and the Obergurgl ski school has an excellent reputation. Obergurgl is the kind of place that attracts a loyal clientele and many experts on the slopes here started off in the resort. The downside to Obergurgl is the altitude. Most of the time the height of the resort means that the snow conditions are so good that it is easy to learn on. But when a snowstorm kicks in, the slopes can quickly become an unwelcoming place. Time then to test out those luxury hotel facilities. Those that are looking for a real "Austrian experience" for their first time skiing could do a lot worse than heading for the resort of Lermoos. Lermoos is a charming village in the lovely winter landscape of the Ausserfern region of the Tyrol. 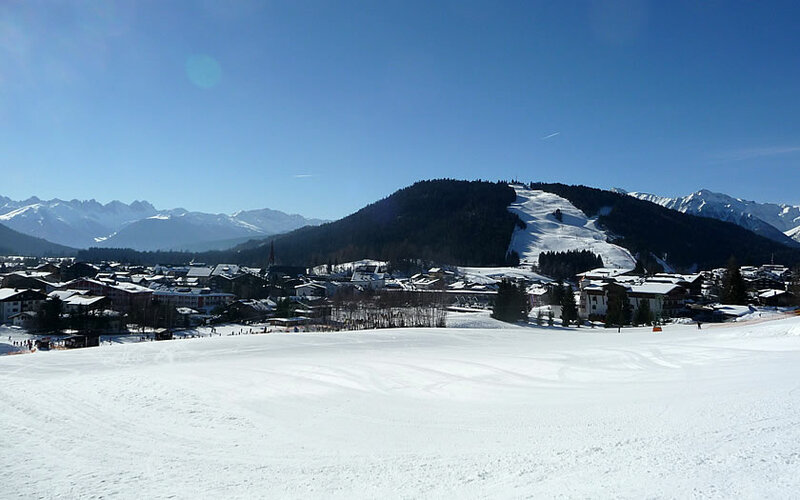 The beginners’ ski slopes are situated at the base of the lifts near the accommodation and there is a stunning view from the nursery slopes across to Germany’s highest mountain, the Zugspitze, and the neighbouring resort of Ehrwald. Once the easy slopes have been mastered, there is a good choice of intermediate slopes further up the main ski area. Strangely and sadly, this is a resort which appears to have fallen out of favour in the main package ski holiday company brochures but for those who wish to make their own way from Munich or Innsbruck, Lermoos should prove a good choice for their first holiday on skis. Obertauern is the province of Salzburg’s answer to the Tyrolean resort of Obergurgl. In fact, the Salzburg residents would probably point to the fact that it is a larger settlement (and probably ski area) than its Tyrolean neighbour to the west. Obertauern is not particularly attractive – it is essentially a ski resort strung out along the road over a high mountain pass – but the snow hides a multitude of sins and the resort does offer a good range of hotel accommodation as well as some excellent intermediate skiing. The altitude and proximity to the slopes are advantages for beginners and there are plenty of easy runs to practice their new-found skills. The location on the border between Salzburg and Carinthia means that the choice of airport is a little restricted and the transfer to the resort is not short (although mostly on the motorway).